Third graders study Indians and do a lot of discussion about how they use natural resources for all their needs. I thought it would be fun to think about how they make their blankets and anything else that is textile related. After some discussion about how the indians (and pioneers for that matter) had no stores that sold fabric etc., we talk about how yarn is created (spun from animal hair) and how they dyed the yarn (plants and minerals). The ancient craft of weaving is found in countries around the world and people have woven yarn and fibers to make useful items for centuries. We then talk about the weaving process itself and how a loom is made and the weaving is held together. The indians made crude looms by securing tree branches together, then evenly tieing thin string from top to bottom (the warp). 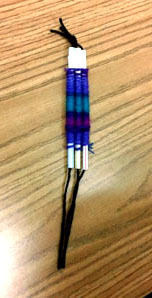 Weaving then begins with the “weft” yarn. 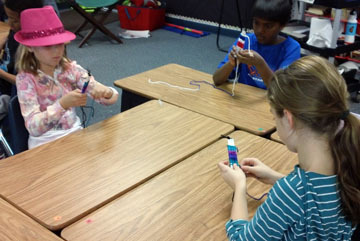 Creating a loom with 3 straws is an interesting project because it makes students think about how they can use everyday things to help construct their art. There is an element of problem solving with this project that I like. 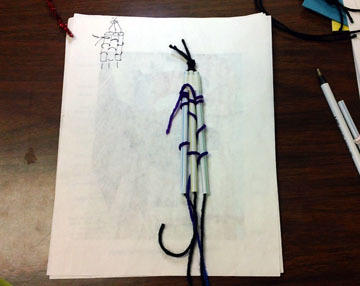 This project can be a stretch for some 3rd graders because they haven’t quite developed the fine motor skills or the “following directions” skills necessary for success. Usually, everyone comes out with something lovely, however and I think the boys appreciate this project more than the girls! 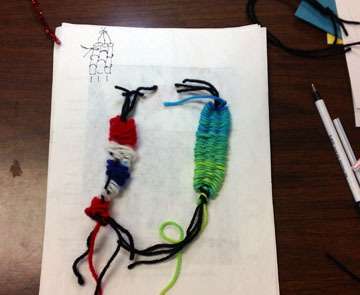 The biggest challenge is getting students to understand the concept of weaving and catching one straw at a time in an “in – out” and “around” pattern. Once they have their “ah ha” moment though, everyone works really hard to finish. I give directions in a number of ways … verbal, demonstration, and then actually physically help move the hand for some. 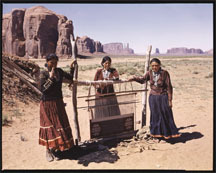 For some students, it is difficult holding the loom and weaving at the same time. In this case, I masking tape the loom to the desk and that seems to help. The loom is secured at the top with masking tape, black yarn inserted for the “warp” using sparkly pipe cleaners to catch and pull through, we tie off the multi-colored “weft” string (thank you Wal-Mart), and then the weaving begins! About 10 minutes before our class is over, I walk students through carefully taking apart their loom and tying off their weaving. Make sure the “warp” threads stay in place! Pull the straws down out of the weaving! Wallah – they have a bracelet or a bookmark!